Pretty Little Liars may indeed be guilty of endlessly teasing out the true identity of the villainous "A" that’s been stalking the quartet of high school beauties since before the show even began. However, because the show's escalating game of cat and mouse has been running for so long, those on both sides of the lens have gotten much better at playing it. 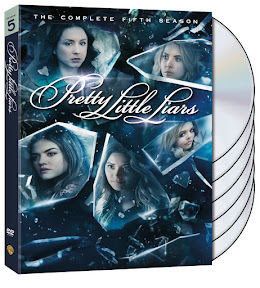 And luckily for viewers settling in with the twenty-five episodes that comprise the newly released fifth DVD box set, this translates to the strongest season of the wildly successful ABC Family Channel original series so far. Though it’s a thoroughly modern series where the latest technological devices carry with them a threat on par with a deadly weapon, there’s always been something refreshingly old-fashioned about the structure and style of the of the fan favorite (also dubbed PLL). Based on Sara Shepard’s collection of eponymous novels, Pretty Little Liars has long been obsessed with the past – in particular the consequences of its characters' adolescent sins under the rule of former Queen Bee, Alison DiLaurentis (played by Sasha Pieterse) that continue to control the fate of the so-called liars in the present. Picking up exactly where the fourth season left off, season five begins with the aftermath of a gunshot blast which puts one person's life on the line while bringing another – namely Alison – back from the dead. Reveling in the motifs of classic literature and film noir, the impressively shot season premiere makes thematic and cinematographic allusions to The Third Man as the very much alive Alison runs through the city streets, her shadow multiplying in size much like Orson Welles's did in Man as the unforgettable Harry Lime. 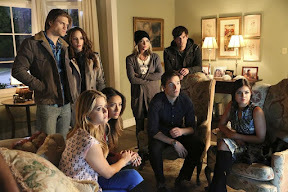 Although PLL’s tendency to focus solely on the identity of "A" in previous installments caused the narrative to stop and start as if playing musical chairs, fortunately the return of Alison brings with it a deeper understanding of the show's many enigmatic supporting players from Melissa to Mona and beyond. Filling in some of the missing notes of what transpired the night that Alison was buried alive, Pretty Little Liars wisely moves beyond that played out song. Far more interested in the long con overall, while the show still knows how to shock with its trademark startling third acts, in its fifth season, it shakes up the tempo, moving beyond the short term satisfaction of formulaic genre thrills. No longer content with one hit wonder watercooler moments, the increasingly unsettling last dozen episodes included in this binge-worthy collection achieve something closer in spirit to operatic tragedy. Expanding the mythology of the series to reveal that the roots of the story most likely began with the parents of its characters, Pretty Little Liars indulges its passion for the past even more. Never shying away from self-conscious theatricality, in stepping up its love of doubles, doppelgangers, strong character/color associations, red herrings, and Hitchcock blondes, Pretty Little Liars has morphed into one of cable’s strongest successors to David Lynch and Mark Frost’s early ‘90s ABC classic Twin Peaks complete with its own Laura Palmer by way of Alison DiLaurentis. And while it's always played with point-of-view and unreliable narrators (at least in retrospect), season five marks the first time that we begin to see the cracks in the friendship of the girls – with and without Alison – last for longer than an episode. Thus it’s only fitting that the cover image for the DVD is a shattered mirror with the reflection of each girl contained within and separated from the next by a shard of glass. Stumbling on new evidence concerning their neighbors, parents, lovers, and siblings – the group goes from lying to the police for Alison to discovering one of several lies their friend has told them in the place of truth. Keeping additional secrets from one another leaves everyone wondering where their loyalties lie and likewise just how much they can trust the suspicious new residents that enter their lives like clockwork each and every season. Yet by cleverly changing the way they're reflected back to one another onscreen, the audience starts to view the characters in a new light as well. Building upon the solid foundation of its intricately plotted, puzzling episodes including some season standouts written by showrunner I. Marlene King (and directed by supporting cast member Chad Lowe), even when Pretty Little Liars threatens to grow too convoluted with some questionable twists and turns that rely too heavily on the tunnel vision of its characters, its charismatic cast keeps it grounded in reality. Though by now they could populate an entire town in sheer number alone, to their continual credit, the gifted ensemble (anchored by series standout Troian Bellisario), are able to turn on a dime– readily revealing unexpected personality traits from one moment to the next. More specifically in season five, a classmate’s role goes from minor to major, leading to an alarming twist and a shocking revelation wherein we realize that – much like the other beloved characters we're now starting to suspect – one of the evil masterminds may have been hiding in plain sight since the show's series debut. Thankfully whereas the lack of parental involvement defied logic to a more dubious degree earlier on, now that the characters have gotten a little older, Pretty Little Liars is able to more convincingly raise both the level of suspense along with its characters' independence. From a home explosion in the one hundredth episode to an elaborately preserved crime scene that's been transferred to a storage unit, the fifth season of Liars finds the fate of multiple characters in jeopardy while moving from creepy camp to deadlier stakes than we'd previously encountered thus far. In its most frightening season bookend yet (that once again ties into the theme of karmic revenge), the girls go from lying about an abduction to protect their friend to becoming part of a horrific kidnapping plot for real in the span of twenty-five thunderously paced episodes. To its credit, this season does answer some longstanding questions to a greater degree than the show did before in its maddening two steps forward, one step back approach. Nonetheless the chilling cliffhanger’s final moments make it obvious that – in staying true to the spirit of PLL since the very beginning – the key to solving the riddle and point of "A" has less to do with the future than it does with the past.